Wace Morgan is getting behind a national initiative aimed at supporting people living with dementia. Dementia Action Week takes place on 21-27 May when everyone is being asked to take actions big and small to improve the lives of people affected. “In the UK, one person develops dementia every three minutes. Yet too many people living with dementia face life alone and are excluded from society. “We are doing all we can to help. We are officially a Dementia Friendly Firm and are registered on the Dementia Action Alliance. “As well as helping to raise the profile of Dementia Action Week, we are supporting a new Shropshire group, called Professionals with Alzheimer’s (PALZ),” Sam said. 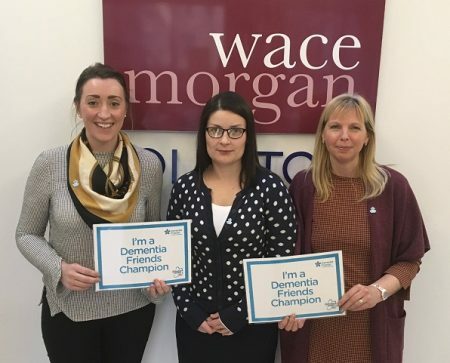 Wace Morgan also has three ‘Dementia Friends Champions’ Nicola Hawes, Lydia Owen and Rachel Wierzbinski, who carry out this voluntary role supporting the Alzheimer’s Society, and all of these measures form part of the firm’s Vulnerable Persons Policy.